Currently, the RRRA owned repeater system is K2RRA/R and our affiliates are N2HJD/R (aka: The Megaplex) and W1YX/R. The K2RRA/R repeater system is owned and operated by RRRA, with its trustee being Joel, N2EZV. It operates on the frequency 146.88 MHz with a -600 kHz offset and 110.9 Hz PL tone. It is the only non-profit owned repeater system in the Rochester area. 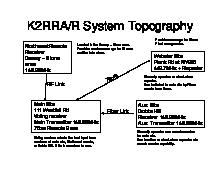 K2RRA/R, affectionately known as "88", has been on the air under different callsigns for decades. The Megaplex, owned by Bob Shewell, consists of thirteen repeaters on these bands: 10 M, 6 M, 2 M, 222 MHz, 440 MHz, and 1.2 GHz. It has been growing since May 1988. There is also Both IRLP and Echolink VOIP connectivity.